Cookies and Crayons » Blog Archive » The Christmas Season is Here! We’ve been a bit slow to get into the Christmas mood around here. We moved, we travelled, we unpacked… In truth, though there are lights on the tree, there are still no ornaments (this is more due to our lack of finding hooks). Anyway, the real sign that the season is here is that the stockings are up. Connie has her official stocking so she’s is officially a Sharabura now. We’re a bit light on the “Woof” stockings – it’s been a hard year for us in that department. We forge on though. 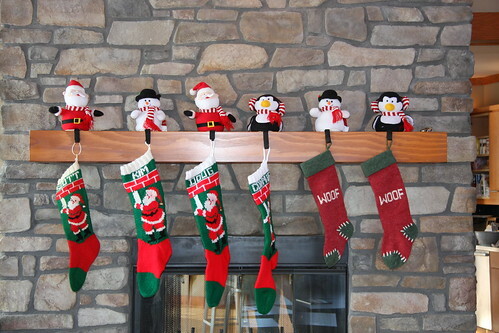 PS – for parents or pet owners – those stocking holders came from Rona and are THE BEST! They are totally stuffed. We had a stocking holder hit Dougie in the head last year and were thrilled to bits to find something that would hold the stockings and not cause bruising if they were pulled down.